Once again, thank you for your interest in the adidas Sundown Marathon! We are happy to inform that you are one of the few in the waiting list which will now be able to register under the limited slots category of 84km. The current race fee price is S$120. - This Web Page Link is unique to you only and can only be used once. - This link will expire on 17 March 2008 at 2359h. - Your position on the waitlist will be deleted upon expiry of the link. We look forward to seeing you at the race! Yahoooooooooo..................I've been selected. So now, register for the Ultramarathon 84Km, Intensive training, beli tiket ke Singapore, booking hotel accomodation, buy new shoes. 84KM - the total distance I have to complete in 15hours. My target is 12hours. The first 42Km around 5hours and the second 42Km around 7 hours. The run will start 8pm.....Yes 8pm night time. So part of my training will be night running. 84Km equal 2 times of 42kM (Full Marathon). 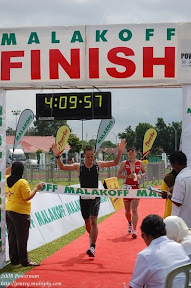 I've only done one Marathon and that was in 2005 -1st Brunei Marathon and my time was more than 6 hours due to injury problem. I have done around 10 half marathons and my best time was 1:59:56 hours. 84Km is like going from my house to Sg Liang. To Tutong is just around 50 plus. Since I've wasted 2 months of little training then I've to intensify my training but not to over do it sampai injured. Most probably my maximum training distance will be around 25Km to 30km and probably back to back running i.e. saturday and sunday morning run with 21km each just to torture the leg. Of course lah I will not be running all the way......run-walk-run concept. The objective is to finish the race within the time limit.